Our brand new course, All the Things, launches in just one week. We’ve been hinting at it over the past month, and we’re now ready to share the actual launch date: Tuesday, February 13. This is, by far, the most comprehensive training we have ever done here at The Sweet Setup. It is focused entirely on productivity and task management, and there is quite a bit more to it than just the tutorials for mastering Things 3. This course will give you some great tips and tricks for fine-tuning your task management and daily focus. Module One of the course is a series of video screencast tutorials that take you line by line through the entirety of Things 3 on Mac, iPad, and iPhone. Module Two is a wholly separate productivity and task-management course. We know a lot of our readers use OmniFocus, Todoist, or something else. Thus we wanted to also have a section of the course for anyone, no matter what app you use for your task management. In the coming days we’ll be posting several new articles as part of our countdown to the new course. We’ll also be sharing a complete rundown of all the things we cover in All the Things. 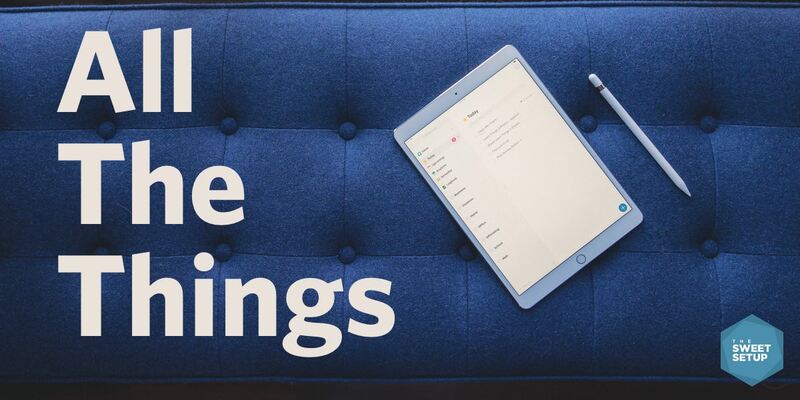 Our in-depth review of Things 3 as our pick for the best productivity app. How to ensure your task inbox doesn’t get overloaded. What is a shutdown routine and why does it matter? How to use your task manager to process email. Starting tomorrow and leading up to the launch of All the Things, we’ll be posting a handful of new articles and videos on productivity and task management. Wednesday: Sneak peek from the “Hybrid Productivity” method video, as well as the 6 areas of my overall productivity focus. Thursday: A comparison breakdown between Things, OmniFocus, and Todoist. Friday: My most-used AppleScript for Things on the Mac. Monday: Complete list of all videos, interviews, and training included in All the Things. Tuesday: All the Things launches. You can find out more about the course here. And, if you have any questions you’d like us to answer (about the course itself, or along the topics of the course) please don’t hesitate to ask. You can email us, or ping me directly on Twitter.